A friend gave us The Jesus Storybook Bible- Every story whispers his name. 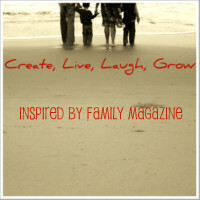 We love it especially for our Family Devo time. You can go on their website and download or just view the current Bible story video that goes along with the book for free http://www.jesusstorybookbible.com/index.php they change out the videos regularly. Sometimes depending on how much time we have we only read the Bible and watch the video or we use one of the following books below to help them have more of a visual to go with the Bible reading. I grew up in a family that carved time out of our day to read the Bible and to discuss it as a family. I must admit I went through a phase probably middle school when I had such a bad attitude at the dinner table when my dad tried to read to us. My father was not a bible scholar nor a learned man in the Bible but he felt very strongly about reading scripture as a family. Now as I look back to those days I feel so blessed to have had my father instill in me such a love for Jesus and a desire to pass on the truths of scripture to my children. 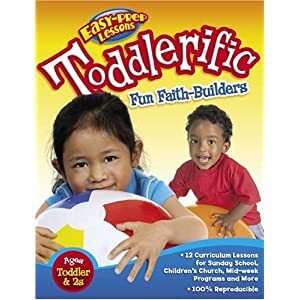 We also use this book along with our bible reading to give the kids more of a visual or hands on experience to what they are learning. You can get either of these books online or at your local Christian bookstore. Most of all of their ideas are very short and practical. Or this one for older kids but we have also used it with our toddlers. This has some fun science tricks and each trick illustrates an important Bible Truth. This devotional we just use alone with the Bible. 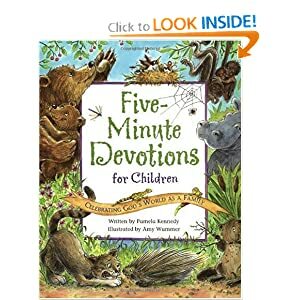 Our boys love because it talks about animals and also gives interesting facts about them such as:otters, iguanas, ants etc... and gives a little devotional using the animal. If you go Amazon.com you can get a peak inside the book. found you through bacon time! what a great resource! thanks for posting it. we've just recently found www.jcplayzone.com that has some videos and music on it. this is another site i'll have to try with my son! i'm also a new follower! stop over sometime and say hi! Andie thanks for the link for music and videos. Great to have you as a follower! Love your site I will have to stop by some time and link up!